Best Car Trash Can for Litter with 30 Free Liners, Leakproof, Odor Proof, Insulated for Car Cooler, Hanging and Back Seat Car Garbage Bag, Perfect Gift for Family Trip, 100% Satisfaction Guaranteed! If you have been waiting for the right garbage bag for your car, you don′t have to wait any longer. Its time for a tidy, organized and fun trip with your family! Car Organizer experts researched, tested and customized a perfect versatile car garbage can for your vehicle. Use the bag according to your need and you will find it just right always! Car Organizer is not satisfied until you are! If you are not 100% satisfied, just return your car garbage can within 30 days for full refund, hassle free no question return policy. Car Organizer is ready to prove everything it claimed, quantities are limited so time for action! And you will wonder how you ever managed without it, we are sure its just a perfect car garbage bag for you and your family. Get ready for clean, organized and odor less car for happy and fun ride with friends & family! Car Organizer experts made the exclusive multipurpose CAR GARBAGE CAN to make your vehicle MESS FREE with 30 BONUS disposable liners. QUALITY PRODUCT- Its made up of 600D GENUINE POLYESTER with professional stitching. Back side has adjustable strap and hook for quick and perfect installation. Metal frame keeps it open for easy use. CAR TRASH BAG – Its waterproof, leak proof, spill proof & odor proof. High quality insulated lining. Three sturdy side mesh pockets for extra storage. Just perfect car garbage bin for your family! CAR ORGANIZER & STORAGE- Its not only a perfect car litter bag but also great for storing and organizing small but essential stuff which you always need at road trips. Toys, sippy cups, headphones, kids activity kits and even books are some of them! CAR COOLER & PICNIC BAG- Car garbage bag has high quality insulated lining, so just throw some ice cubes, drink cans and you are ready for summer fun trip. 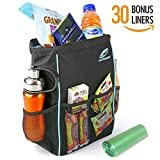 It can be a perfect picnic bag, side pockets are for small snacks, cups, bottles or cans. If you have been waiting for the right garbage bag for your car, you don?t have to wait any longer. Its time for a tidy, organized and fun trip with your family! Car Organizer experts researched, tested and customized a perfect versatile car garbage can for your vehicle.